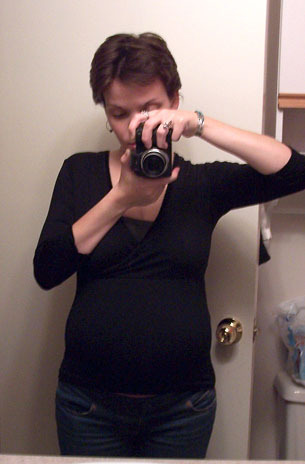 Aside from the obnoxious love handles I could almost pass for not pregnant from head-on. I feel so small by comparison to how I was last time, but I guess there isn’t much of a difference when I actually compare a photo from around the same time. I’m just differently shaped. Baby isn’t as high into my ribs this time, and I never feel any movement above my navel. Last time I always measured a little bit ahead, this time I’ve been measuring around 2cm behind the entire time. The baby is sitting much deeper, I can feel him almost right against my cervix. Tempest didn’t sit that low until I was around 32 weeks, when she dropped and engaged. He never moves out of this little nest in my pelvis. 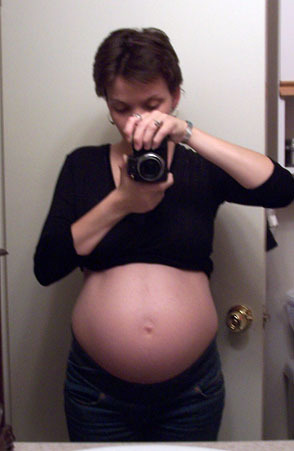 She was everywhere, all the time, cracking ribs and bruising things… It’d be nice if this carried over post-birth, too. I am contacting you because I am working with the authors of a book about blogs, and I’d like to request permission to use the photograph you have posted (Bottom Right) in this book. Please contact me at mattvid07@gmail.com, and I’d be happy to give you more information about the project. Your assistance is greatly appreciated. i don’t think you look the same size, i think the angle of the tempest pic gives the illusion that you’re about the same size, but it seems if your belly button was pointing the same direction, you’d be much smaller. (yes, i put a lot of analyzation into this)…and this baby of mine seems lower, too. i do feel him kicking above the belly button, but i’ve also felt what i think to be his hands digging around my cervix. now that’s a weird feeling! awwwwww.. your belly’s soo cute.. hows tempest?? Hehe, like bellies do you? you totally look diff this pregnancy. you’re more like pear shaped. I bet if someone saw you from behind, they couldn’t tell you were pregnant. You rock the pregnant look and you can wear regular jeans too! I only hope that if I ever get pregnant, I’d look as good. hahaha. LOL, those aren’t regular jeans, they’re maternity! They’re just underbelly. My hips are smaller this time, though. With Tempest I gained 50lbs and my thighs got a lot chubbier and I couldn’t fit into any of my old jeans. I can still pull my pre-pregnancy stuff on this time, I just have to have the fly undone. What a great belly! This fetus is nicer than Jules, too- the couple kicks I’ve gotten in the ribs have been so gentle… Julian spent the whole 40 weeks in my ribcage, I swear. He didn’t “drop” until after my water was broen at 9.5cm. This one is much lower, and I feel most of the kicks on my right side. I’m pretty sure the placenta is on my left side because I’ve never felt anything over there. I have felt literally 99% of kicks (which I’m pretty sure are actually punches) just above my pubic bone. I’ve felt two discernable kicks elsewhere. They’re ALWAYS in the same spot. I start to wonder if this child has no legs. I have this huge irrational fear that the baby is really deformed. 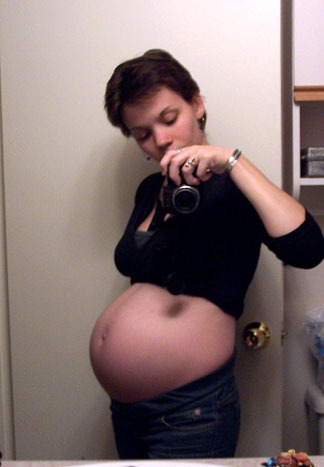 It’s one of the reasons I want an U/S… I want to see a normally shaped baby. Don’t you have an anterior placenta? Not sure. Initally it felt anterior on the lower left side, but has since appeared to move and I’m not sure where it is. I can’t hear the loud swishing where I used to, and I think it may be in behind now. You are so very pretty! I love your short hair.